Although I’ve lived in Texas my entire life, the two places I’ve lived are very different, particularly when it comes to Mexican food. I grew up in El Paso. My house was a cotton field and a six lane highway from the border with Mexico. Needless to say, I’ve had my share of fantastic food, most of it made in the kitchens of my friends’ Mexican mothers and grandmothers. When I moved to Austin almost 20 year ago, I had to learn how to navigate the many “Mexican Food” offerings that were really Tex-Mex. I’ve come to love Tex-Mex too, but it took me a while to learn the secrets to finding food in the tradition of those kitchens I’d spent so much time in while growing up. While I can make or have found sources for most of my favorites, gorditas continue to elude me here in Austin. In fact, whenever I travel back to El Paso, a stop for gorditas is always on the itinerary so I can get my fix. For the sake of my waistline it’s probably good that I can’t lay hands on great gorditas easily, but I continue to hunt for a local source so I don’t have to fly 600 miles to get them. A couple of weeks ago, Addie Broyles tweeted out that she was enjoying a gordita from a taco truck near the Statesman offices. 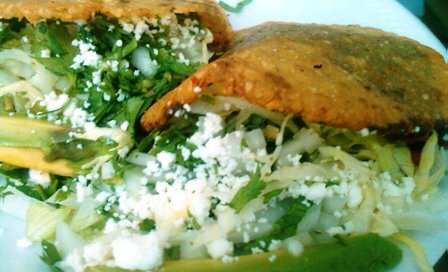 One look at the picture she shared and I had hope that there might be a local source of the gorditas I’ve been hunting for the last 20 years or so. I immediately took myself down to the Taqueria Star truck to sample their gorditas and was very satisfied. The couple running the truck makes each gordita (or taco or sandwich) by hand and the results are worth the wait. While not exactly like the gorditas I grew up on, Taqueria Star’s are still amazing. Built on a base of black beans with freshly griddled meat of your choice, the gorditas a generous in size and filling. They will warm your heart and your stomach, and at $3.50 each they are very budget friendly. A quick search on Yelp finds that a few others agree that this food truck is worth a stop next time you’re craving a gordita or taco. It’s really hard to get authentic tex-mex in Bangkok. There is a sun rise taco that opens all night. A Coyote that has the hottest chili cocktail. But not authentic like the photo your are showing.